The most successful brands will be the ones that understand what videos work to meet their objectives. 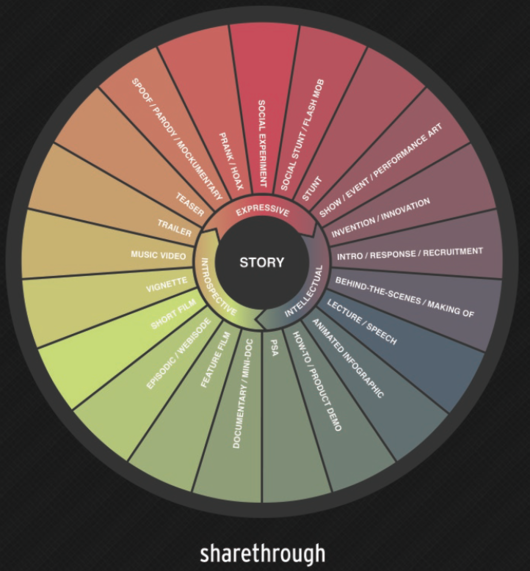 (See Content Loop graphic below) As the Content Loop highlights, a good story should lie at the heart of every piece of video content, but those pieces of content should fit roughly into a specific genre and category. The 12 videos below were not only captivating, but the brands behind them understood the need for the video type to act as a conveyor of the overall message, instead of relying on just the creative execution. Consequently, these 12 brand videos will ultimately have the largest creative impact on the industry. 12. The Cinematic Parable: The Guardian "Three Little Pigs"
The Guardian has an intellectual audience so using an extended metaphor to tell the story of how modern news gets disseminated is something that can easily be followed. Exploring the financial crisis through the story of the three little pigs is clever, accessible and surprisingly thought provoking. The Guardian took a creative risk in producing this video, yet it paid off handsomely and should inspire other brands to produce high-quality content that explores important issues. 11. Worthy Teaser: Honda "Coming Soon"
This perfectly executed teaser served to build excitement in advance of Honda's Super Bowl video. Teasers are difficult to pull off in brand videos, which is why they're mostly used for movies. By simply revealing the return of Ferris Bueller, Honda sparked the curiosity of millions as people wondered what hijinks Ferris would be up to and for what brand. While the video itself didn't live up to the impossibly high expectations, the teaser provided an example of when, why and how one should be made at all. 10. Celebrity Stunt: Pepsi "Uncle Drew"
Having athletes play characters isn't exactly new, but it's rare that they get so disguised that no one knows who they are. It's usually athletes appearing as cameos in movies like Brett Fav-ruh in "There's Something About Mary." As Uncle Drew, Kyrie Irving becomes an old man who completely fools an entire court full of pick-up ballers as he slowly gets his game on. He goes from old and out of place to spry and dominating. Further he's created a character for himself that he's already played again as Uncle Drew 2. Look for other athletes to try to create similar successes and look for Kyrie Irving to turn Uncle Drew into something much bigger. 9. Perception Shifting Connection: AXE "Susan Glenn"
The AXE brand is synonymous with lascivious teenage boy-men; so much so that an attempt to appeal to more sympathetic emotions risks losing the brand's identity. With this video, however, AXE gracefully appealed to a universal sentiment. This video connected with its' audience by sharing in a sense of loss that, importantly, doesn't come across as sad or weak. By establishing a true emotional connection with its' target audience it can lock them up before going back to appealing to their lesser instincts. Proved once and for all that for brand videos shorter is not always better. The overwhelming success of this video gave creative directors cover when pitching ideas that require more time than a minute freeing brands to tell richer stories that benefit from more deliberate set ups and pacing. If I told you in 2011 that the most viewed video would be a 30-minute documentary about a homicidal sociopath, I doubt you would have thought I was sane. Brands are wise to consider the ramifications of that. 7. Interactive Vignette: Old Spice "Muscle Music"
Marketers are obsessed with YouTube views. In fact, when defining what it means for a video to be viral, most simply define it by a video's high YT count. Thus, YouTube has a tight hold on marketers who won't run their videos on another player. This is changing, though, and Vimeo is positioned best to eat into YouTube's market share. Vimeo offers a higher quality viewing experience with options such as interactivity that YouTube doesn't provide. Having Old Spice, the reigning king of digital brand video execute one of the year's most popular campaigns on Vimeo to the exclusion of YouTube was a big deal both psychologically and effectively with the video gaining close to 8 million views. The Old Spice/Vimeo partnership augers well for a future after the cult of the YouTube view. 6. New-School Inspirational Short Film: Nike "Make It Count"
The internet has created a whole new category of film auteurs: filmmakers who have constructed unique styles as a consequence of small budgets and the freedom to answer to nobody but themselves. The fact that brands want to work with this new talent isn't surprising. What is, however, is seeing a brand let one of those filmmakers make a film entirely in their own voice. While it may have never been Nike's intention to be so hands-off, the success of the video serves as an example of what a brand can gain by letting the filmmaker do his/her ting. 5. Anti-Establishment Launch: DollarShaveClub.com "Our Blades Are F***ing Great"
When this video debuted in March it was an instant sensation garnering roughly 5 million views in its' first three months - not bad for a video that cost $4,500 to make. CEO Michael Durbin's epic interpretation of the "walk and talk" had viewers in stitches while he instantly created brand recognition for an upstart brand in a highly commoditized market dominated by huge conglomerates. Young tech CEOs everywhere dream of duplicating the launch of DollarShaveClub.com, while brand managers at those big guys certainly took note of a new competitor who's operating with a different playbook. 4. Honest Conversation: McDonald's "Behind the scenes at a McDonald's photo shoot"
Watching a commercial for a fast food burger, at some point you've wondered why the hell does the burger look so much better on TV than when I actually buy it. The genius of this McDonald's video lies simply in answering the question in an honest, clear and succinct fashion. All cards are on the table. This is a perfect use of brand video because a thoughtful answer needs more than 30 seconds to reply appropriately. Look for more brands to take on questions similar to their industry as a way to turn perceived weaknesses into strengths and to connect with their customers in an authentic and interesting manner. 3. Social Stunt: AMC "Zombie Experiment"
Social stunts have been one of the most reliable genres for brands to achieve viral impact. While this social stunt didn't earn the most views this year - that would be TNT Benelux's "Dramatic Surprise" - this was the most complete. It provoked screeching fear from some and annoyed bemusement from others. Ultimately, it provided a big smile and the relief that these very real looking zombies are not, in fact, living among us. The way in which this video works both as a newsworthy happening in real life as well as a fun-to-watch piece of brand video content will have advertisers looking to duplicate the many levels on which this works. The success of this video is best understood not in views, but widespread cultural impact. Prior to Stratos, Red Bull was already considered by many to be the leading producer of needle-moving content. The runaway success of Stratos took them to another level. Stratos was a project years in the making. It required a level of commitment and investment bordering on ridiculous, but it worked. It changed the realistic scope of what brand content can be, and in so doing inspired brands across the world to think bigger. 1. Beautiful Filmmaking: Intel/Toshiba "The Beauty Inside"
The Beauty Inside incorporated social media into brand content better than any brand to date. Not only wasn't the integration forced, it added a brilliant element to the story. Using real people to play the many different roles of the body-changing main character was simple yet ingenious. More importantly, though, the story was touching and the overall production first rate. "The Beauty Inside" was a triumph of brand content and for that it nets our top spot.